The new white gold Richard Lange Pour le Merite watch with blued steel hands is seen here with the hour dial not fully open– totally exposing the tourbillon escapement. For those who love this extraordinary German brand, it may thrill you to know that there is now an A. Lange & Söhne boutique in the city that never sleeps. A brand that produces an exclusive number of timepieces per year (some say fewer than 5,000), A. Lange & Sohne is hardly accessible to just anyone. 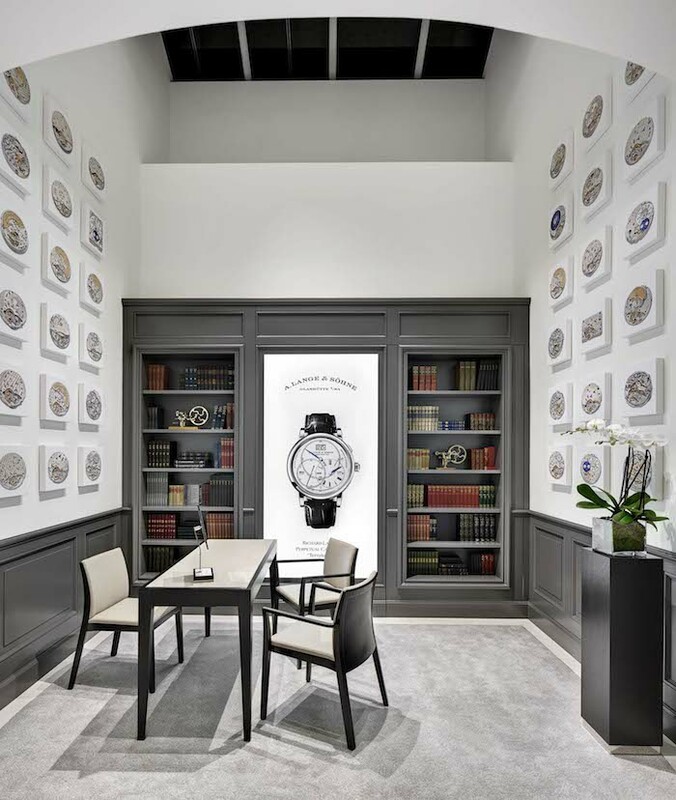 However, with the new boutique, even if you can’t afford to buy an A. Lange & Sohne timepiece, you can now stop in and gape — and see the new timepiece made exclusively for the New York store. In this image, the time is between 6:00 and 12:00 — and the entire patented time dial is open- hiding a portion of the tourbillon escapement aperture. Indeed, last night we attended the Grand Opening celebration in the exquisite more than 2,500-square-foot two-story-high space at 785 Madison Ave. The store was packed full of watch aficionados — signifying the importance of the opening as a truly momentous occasion. CEO Wilhelm Schmid came over from Germany for the grand opening and told the story of how long the brand had been searching for just the right space for its New York flagship: years. Schmid has been instrumental in the growth of the brand and its expansion into the world of boutiques. 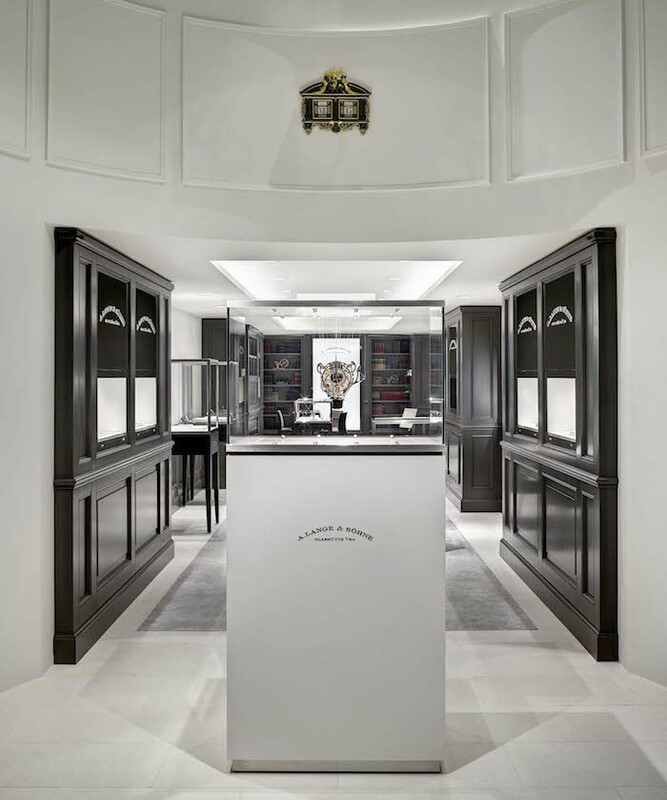 His A. Lange & Sohne concept is to open a network of international boutiques in key cities around the globe where collectors and connoisseurs live or regularly visit.The New York store is the 12th boutique globally. But before we tell you how stunning the boutique is, we need to tell you about the incredible new Richard Lange Pour Le Merite timepiece unveiled for the occasion. 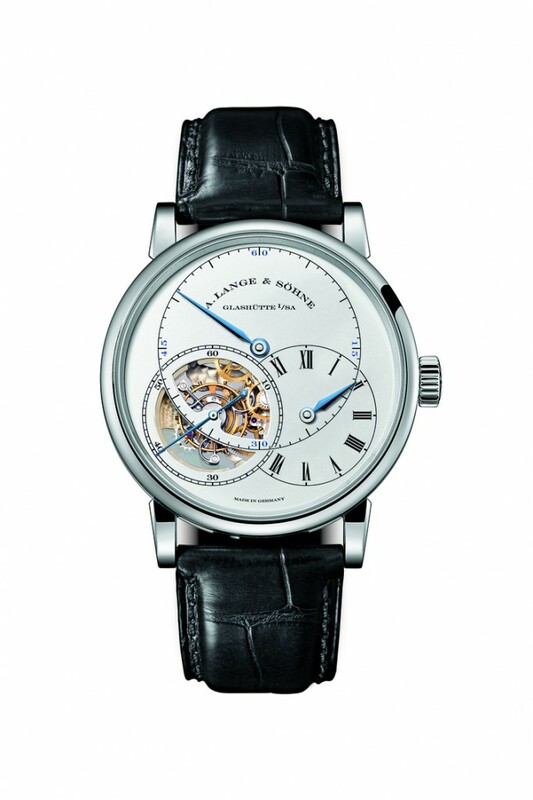 “You can’t have a New York store without a little gift for New York,” said Schmid – and then commenced to show the 100+ attendees the all new A. Lange & Sohne Ricard Lange Tourbillon Pour Le Merite in 18-karat white gold with an argente-colored solid silver dial and blued steel hands. A magnificent rendition of innovation and classical elegance, the 41.99 mm watch houses the manufacture caliber L072.1 manually wound movement. The watch offers a playful side with the patented pivoting dial, but also an incredibly serious side with its hand-assembled caliber and chain and fusee. Hand-assembled, the watch beats at 21,600 vph and offers 36 hours of power reserve. In addition to the stunning tourbillon, this watch features a patented stop seconds mechanism for precise setting, and has a fusée and chain transmission to equalize the force of energy from the mainspring throughput its entire unwinding process. The 361-part movement also offers a partial dial indicator. When the time on the dial (seen on the lower right sundial) is between 6:00 and 12:00, the entire hour dial is visible. The rest of the day, the left portion of the hour dial hides, allowing a full view of the stunning tourbillon escapement aperture on the left side of the dial. This ingenious patented pivoting dial function adds a playful side to the serious watch, which, by the way, retails for $212,900. And now, we will go back to the boutique, so you can fully immerse yourselves into the whole A. Lange & Sohne experience. The stunning boutique is consistent with the very first USA A. Lange & Sohne boutique opened two years ago in Florida (you can read about that here), and with the other eleven boutiques globally — but somehow captures the spirit and vibrancy of New York in all its glory. The black, white and gray (the brand’s signature color) décor is warm and inviting – especially with dedicated seating areas, and a library-like setting. In fact, behind the bookcase, a hidden staircase leads to the VIP lounge and the in-house watchmaker. 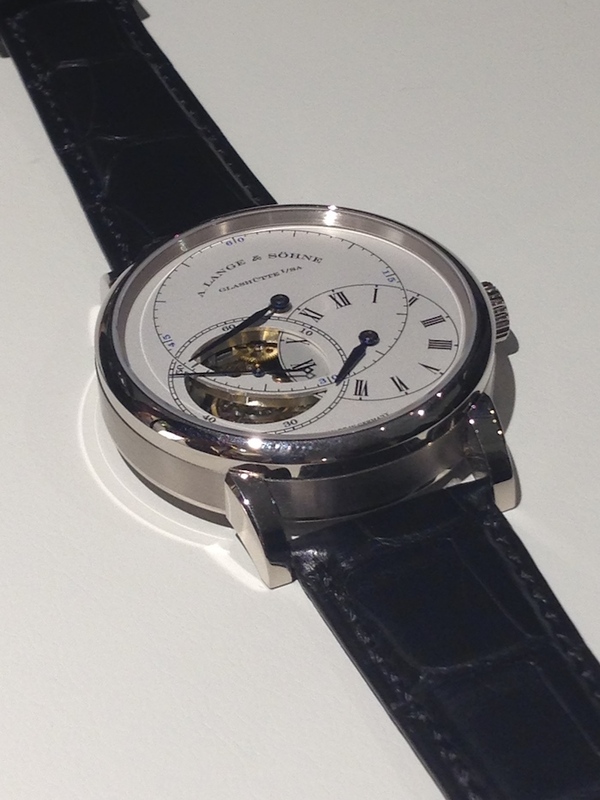 For lovers of A. Lange & Sohne, New York is a new destination. 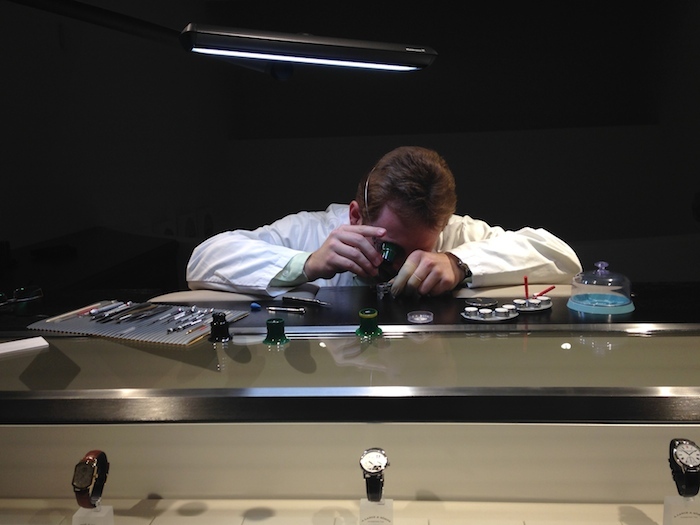 There is a watchmaker on premises upstairs in the A. Lange & Sohne NY boutique.